Circular and double-pointed knitting needles can be used in tandem to complete a project knitted in the round, such as a sweater, cap or socks. Making the change from circular to double-point may seem daunting to knitters who fear getting tangled in all those needle ends, but the process is simple. Determine how many double-pointed needles you want to use--four or five. You will be knitting with one needle and placing the stitches on the remaining three or four. Count the number of stitches on your circular needle. Divide by the number of needles that will hold the stitches. For example, if you have 18 stitches and will be using four double points, divide 18 by three (the number of needles needed for the stitches). You will be placing six stitches on each needle. If the number of stitches does not divide evenly, try to distribute the stitches as equally as possible. For instance, if you have 26 stitches and are using four needles for the stitches, put six stitches on the first needle, seven on the second and third, and six on the fourth. Pick up a double-pointed needle and begin to knit stitches off the circular needle. Stop knitting with that double-pointed needle when you have knitted off the desired number of stitches. Pick up a new double-pointed needle and knit the desired number of stitches onto it from the circular needle. Continue with the remaining needle or needles until you have knitted all of the stitches off the circular needle. Pick up the last double-pointed needle and begin the next round on all double-pointed needles. Switch to double-pointed needles when there are too few stitches to handle comfortably on a circular needle. 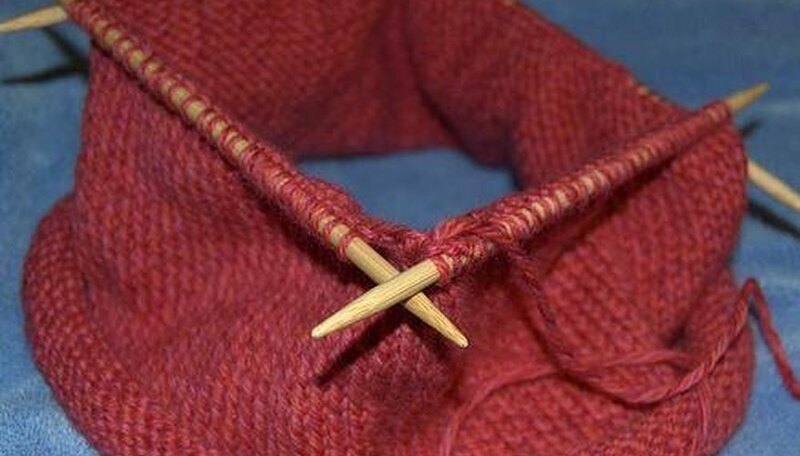 If you have trouble manipulating the double-pointed needles, rest your work on a flat surface until you become more adept. Cameron Delaney is a freelance writer for trade journals and websites and an editor of nonfiction books. As a journalist, Delaney worked for wire services, newspapers and magazines for more than 20 years. Delaney's degrees include a bachelor's degree in journalism from Pennsylvania State and a master's degree in liberal arts from University of Denver.